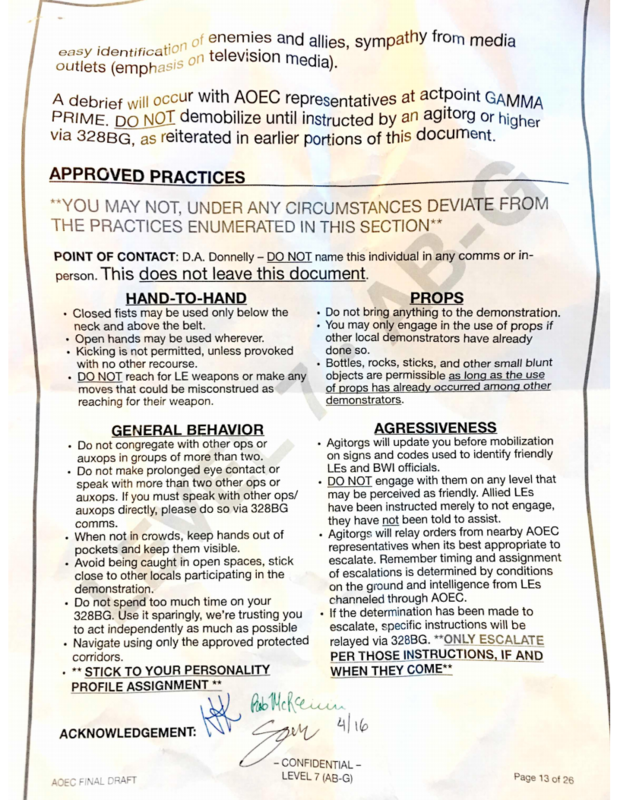 A document was found marked “confidential” – it is a clear set of guidelines and instructions written for paid protestors in Baltimore. You may recall LARGE protests broke out in Baltimore shortly after the April 15th, 2015 death of Freddie Gray. There has long been rumor and ‘conspiracy theory’ that all of the Black Lives Matter (BLM) organizing and rioting was funded by special interest groups, namely, George Soros. Do we now FINALLY have proof of that claim with documents labeled as from ‘Friends of Democracy?’ You be the judge as I break down each page of this document. This article dives into what appears to be DEEPLY rooted corruption among Baltimore officials, law enforcement (LE) and even Tax Authorities (state? federal?). The documents in question also seem to implicate someone with ties to US Intelligence or US military. What you are about to read bares a striking resemblance to a military operation. On the top right of the document you can see a “Confidential level 7” tag. This tells me US government intelligence involvement, or that some one with US government Confidentiality Classifications knowledge is attached to this document. Here is an FAS.org publication on US government security classifications. I have taken the liberty to cut the “Confidential Information” portion and post it here as a photo. Confidential 7, Mobilization plans, I would say that would fit the description of what this document is…Mobilization plans. Three other things really stand out on this front page. The mention of “friendly officials.” Are these the bought and paid for LE and BWI officials?. Lastly we can address the note jotted down in the top right corner that says, “Make sure to also get index from OSI.” What is OSI? OSI stands for the “Open Society Institute” which is now called the “Open Society Foundation” and was founded by George Soros according to wikipedia. Further tying George Soros, and his seemingly “philanthropic” organizations, to military-like actions on US soil, where the goal is to create civil unrest. This has long been a conspiracy theory, now we have documents to connect the dots. Does George Soros use his organizations as a means to funnel money into illegal activities for political gain? 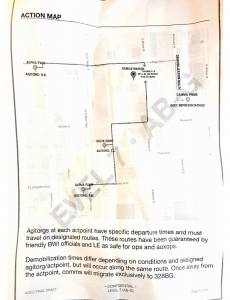 Shows the mobilization points for different sects of paid rioters, the routes to take to the “demonstration”, and the demobilization route. Note the first paragraph under the map. 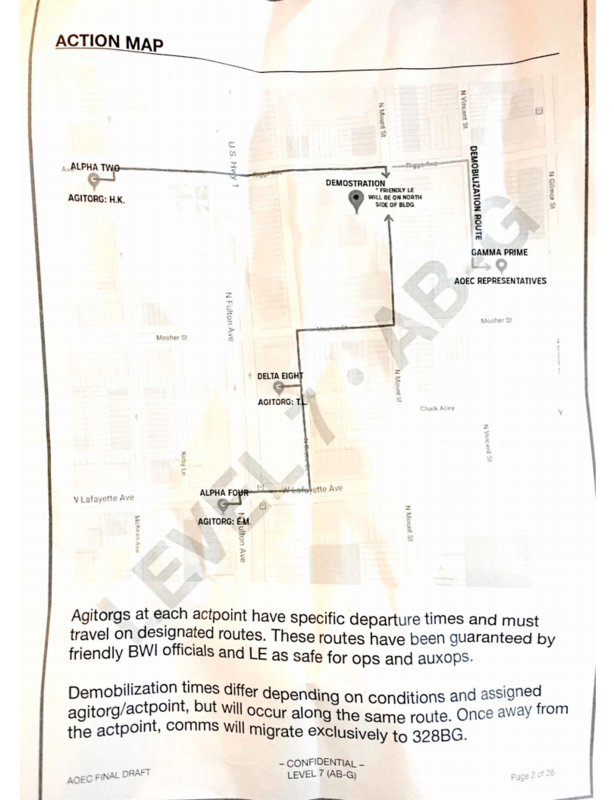 “These routes have been guaranteed by friendly BWI officials and LE as safe for ops and auxops.” This points even more clearly to how deep this operation ran. 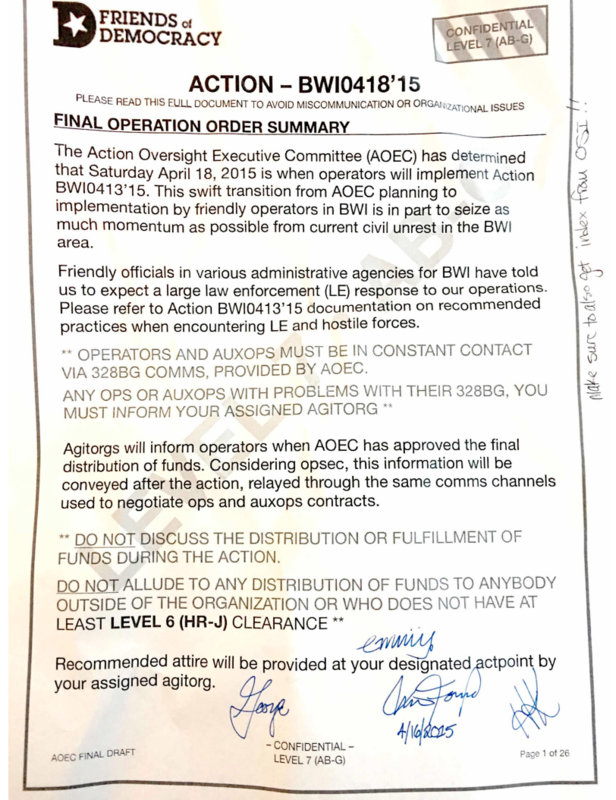 BWI officials and Law Enforcement were both made “friendly”, or for a more direct term, were they paid off? The second paragraph shows possible military/ex-military or intelligence involvement as well. The term “comms,” though easily understood and commonly used, does come from military, but what strikes me more is the referral to 328BG. 328BG is nothing more than a model of tracfone, an LG tracfone to be exact. Why is this relevant? Again, this is how the military refers to equipment. By model number. This page goes over “legal” and the overall objectives of the operation. READ CAREFULLY. The top of this page represents just how deep the op went. AOEC has a well established chain of command, medics and most importantly they had been cleared to break the law and be violent. 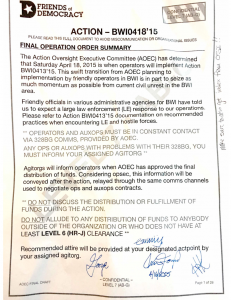 The final paragraph of the top portion states clearly that BWI officials and Law Enforcement issued protections to participants of the operation, allowing them to be violent. 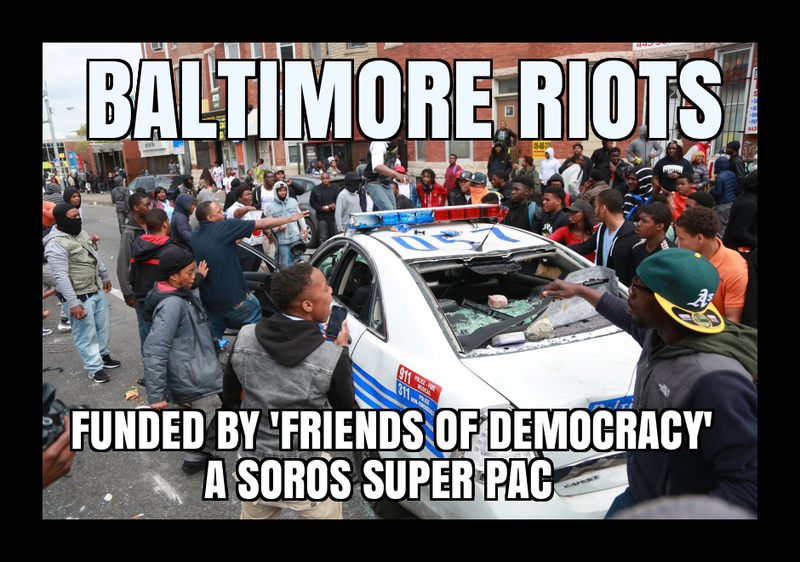 Yes, you saw that correctly LAW ENFORCEMENT and Baltimore officials allowing violence in the streets. Was it for political gain? What can’t money buy? The activities allowed are mapped out on the next page. But, lest we get ahead of ourselves, let’s go over the bottom portion of page 12. The objectives of the operation, Primary, Secondary, Tertiary (third), and IDEAL. Primary goals are to provoke “hostile” LE and BWI Officials. By hostile they mean the honest people that couldn’t be bought. It is in the “secondary” and “ideal” objectives that you see the big picture. The op is all about, “creating an envioronment where organic CONFLICT can grow,” they want to inspire organic actions across the nation, and they want martial-law-like policies to be effected. These goals are very important to keep in mind as we progress. This page describes how the paid rioters should act during the op. Including what types of violence can be used and when it is permitted. Things of note. Well, there is one HUGELY important sentence on this page. “POINT OF CONTACT: D.A. Donnelly – DO NOT name this individual in any comms or in person. THIS DOES NOT LEAVE THIS DOCUMENT.” Who is D.A. Donnelly? Why is it so important to hide his involvement? Is he the District Attorney? We will revisit this soon. 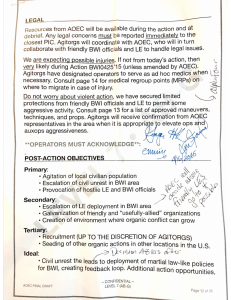 Operators on this page are instructed not to use any props during the op, “unless locals have already begun to do so,” in which case using any “small blunt object” (bottles, rocks, etc) was deemed to be permissible. Remember, Law Enforcement is clearly involved in this op and they are allowing the use of blunt objects and violence to incite none operatives to do the same. 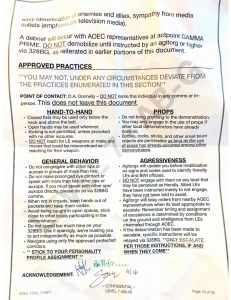 Under “General Behavior” notice the very last statement in bold, “STICK TO YOUR PERSONALITY PROFILE ASSIGNMENT.” This shows you just how advanced and well planned this op actually is. Directors will do this with extras in a movie to add dynamics and to create an authentic feel. For example in a movie where there is a shootout, some of the extras will have an assignment to flee, others to hide, some to scream and others to be silent. Like a movie, this op was orchestrated to have an organic feel. Giving the operators personality assignments ensures this. The very last section “aggressiveness” drives home how involved/corrupt LE was. The doc says not to engage with friendly LE as “they have been instructed merely to not engage, they have NOT been told to assist.” Also in this section is something scary. Some local LE were actually reporting to AOEC, according to the document. “Remember timing and assignment of escalations is determined by conditions on the ground and intelligence from LEs channeled through AOEC.” Let that sink in. 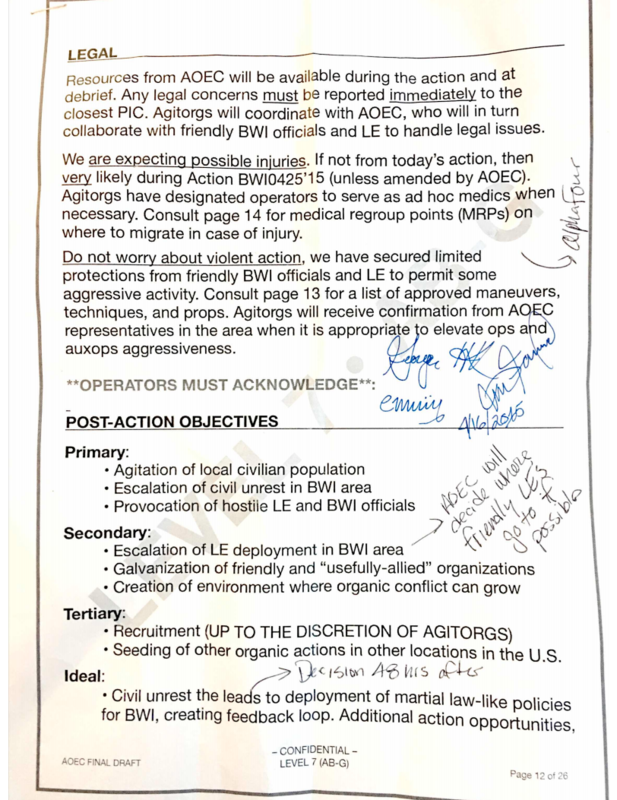 Some officers sworn to protect and serve, according to this document, were reporting to this group, the so called “AOEC”, feeding them intelligence so they would know when and where to escalate violence. 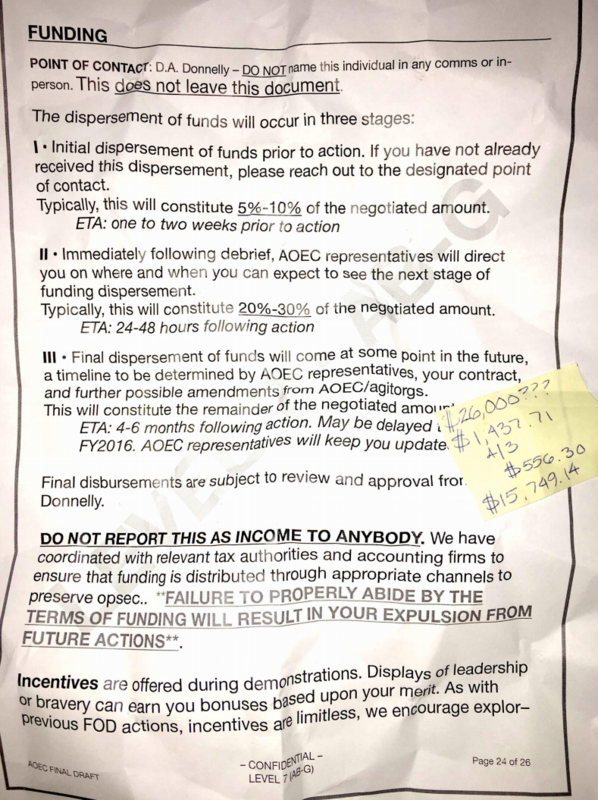 This page refers to the funding. Who’s going to pay the rioters for their work on the op? This page brings us back to D.A. Donnelly, as you can see the same Heading at the top of this page “POINT OF CONTACT: D.A. 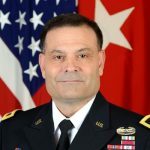 Donnelly – DO NOT name this individual in any comms or in person. THIS DOES NOT LEAVE THIS DOCUMENT.” Later on the page, near the sticky note, you can see his name mentioned again. This section states that “disbursements,” payments, are all subject to review and approval from Donnelly. Turns out D.A. Donnelly does not mean District Attorney, in fact D.A. we can reasonably assume, are his first two initials. David Donnelly the TREASURER of “FRIENDS OF DEMOCRACY” as you can see here. It is pretty important, I suppose, to make it perfectly clear to keep quiet about who is funding such an illegal operation, that involves bribery at it’s highest level AND tax evasion. The second to last paragraph then states in bold caps “DO NOT REPORT THIS INCOME TO ANYBODY.” The document claims that all payments have been coordinated with relevant tax authorities (one can only imagine who that may be) and accounting firms to make sure that all funding is distributed through appropriate channels to preserve “opsec” (an intelligence term for “operational security”). This shows us that the op goes even deeper, as “Tax authorities” (IRS?) were used to hide, “launder”, the money to the operators. 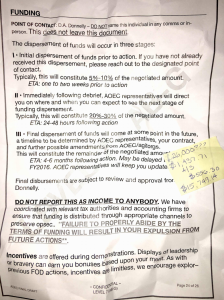 Based on the sticky note on the side of this page, we are talking about a large amount of money being funneled through this organization and out to the operatives. Which would lead one to believe that the highest level of “tax authorities” are involved. THIS is how Soros and company remain under the radar when paying for these ops in the US. They “own” the Tax authorities which allows them to funnel money, “un-detected,” from their organizations down the chain of command to the operatives. Finally the last thing that stands out on this final page of the document (available) is the last line. “As with previous FOD (friends of democracy) actions…” This tells us, that this is not the first time this organization has implemented this militant style op on OUR american soil. The Baltimore riots of 2015 left 113 police officers injured, 2 people shot and one fire victim in critical condition. 486 citizens were arrested. Of that number it is unclear how many were prosecuted to the full extent of the law. The corruption didn’t end with local or state LE. We even saw the Mayor of Baltimore Stephanie Rawlings-Blake (was she more than likely compensated for her actions?) issue an order for police to stand down. Imagine that? 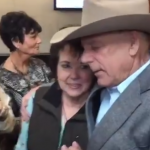 The mayor of a major US city, tells law enforcement to stand down and allow RIOTING, destruction of property, and violence to reign supreme in her city. Read more on this pathetic woman’s actions here. Aside from the injuries and arrests the city of Baltimore saw an estimated $20 Million in damages. This type of operation could not have been planned out and executed by an average person. The person who wrote this document clearly had either military/intelligence affiliation or training. I can assume this because of words like “comms”, “OPS”, “AUXOPS” “OPSEC”, “confidential level 7”, “328BG”, and all of the various acronyms used. This operation was run like a covert military op and has a striking resemblance to the CIA 1953 Iran coup to remove Prime Minister Mossadegh from power. The mastermind behind the coup, CIA Operative Kermit Roosevelt, used this EXACT method to divide the people of Tehran, to give the appearance that PM Mossadegh had lost control of the people. Roosevelt also bought the media, spreading disinformation across Iran, stating that Mossadegh was a communist. A biased media, and the illusion of civil unrest was enough for the coup to take root and eventually be successful in Iran. Does that not strike a very similar chord as to what is going on here in the US today? Are we not suffering from an incredibly biased, bought and paid for, media (CNN, MSNBC, CBS, ABC etc.) that spreads disinformation about our democratically elected official? Calling him just about every name in the book. Do we now have evidence of, what appears to be, a Kermit Roosevelt style attempt at creating civil unrest for political gain? Is there an active attempt at a coup going on in our country? If so, it is embedded deep within our legal system as well as our financial system. Is this page one of the handbook on how to overthrow a democratically elected government, control the media, create civil unrest? You have the information, you be the judge. be a real shame of FOD offices all across the US were to accidentally burn down, especially if someone was in them at the time…..